When I was a kid in the 1970s, I had a book that was a collection of space adventure stories for boys. I've been googling and looking at various online bookstores but haven't found anything that matches. The book was probably from the 1950s or 60s. It was hardcover, printed on fairly thick pulp-type paper, and each chapter started with black and white line art illustrating a scene from the story. There were probably 12-15 stories in all. I think all the stories were written by one person, it wasn't an anthology by multiple authors. If you're familiar with Heinlein's juvenile novels, these stories were the same sort of "young boy has an adventure that helps him become a man" theme, but they were aimed at a slightly younger audience, so they were even simpler. Some of the stories (5 or 6, I think) were connected: they were about two friends who joined a Space Cadets-type organization and were learning to be spacemen. One of these stories was about the friends at school, then another one about a mission to the moon, then a mission to Mars... One of the two had an older brother who was already a seasoned commander and one of the stories had the two friends serving as junior officers on a mission (to Jupiter or Saturn, I think) that the older brother was in charge of. The two friends somehow save the mission, earning the respect of the older brother. The earlier stories were all about exploring the solar system, the last one was about the first mission to another planet, which was found in orbit around the nearest star, Alpha Centauri. I don't recall if it took them 4 years to get there, or if they'd found some faster-than-light travel. I do recall that unlike the earlier stories, there'd been a huge jump in space technology - atomic power, tough but super-lightweight space suits, incredible hand-held blasters... They land on the planet, find it very Earth-like, meet natives who have telepathy that allows the humans to talk to them. Everything seems fine, but the aliens are afraid of humans' violent background and (with some regret) I think they use their telepathic powers to keep the humans from leaving and reporting back. Somehow the leader of the human expedition convinces them that humans are more civilized now (I think the humans have better medical capabilities and they heal one of the aliens who's injured) and they're all friends in the end. 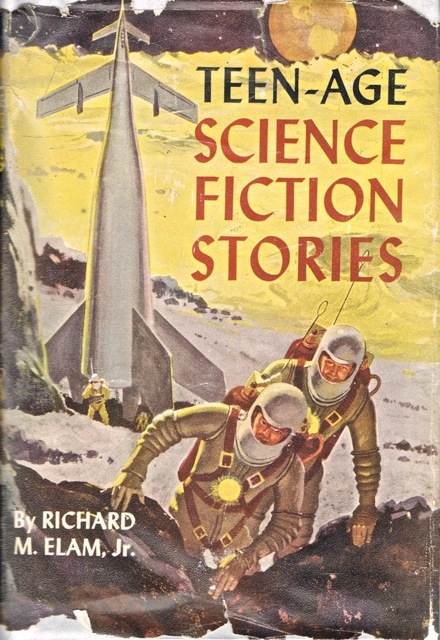 I believe you're thinking of Teen-Age Science Fiction Stories, a 1952 collection by Richard M. Elam, Jr.. If so, maybe the cover or the table of contents will ring a bell. It contains 11 stories and an introductory essay. There are black and white illustrations by Charles H. Geer, a full page illustration at the beginning of each story except "Red Sands" as well as some smaller illustrations. (My copy has a blank page where the illustration for "Red Sands" should be; could be a defective copy.) The same collection was reissued in 1957 as Young Readers Science Fiction Stories, apparently without the essay and without the illustrations, as far as I can tell from the ISFDB. The stories are not all space adventure stories. The first story, "What Time Is It? ", is a time-travel story, described in this old question. Six of the stories ("Lunar Trap", "Red Sands", "The Iron Moon", "Venusway", "By Jupiter", "Sol's Little Brother") are about the adventures of two young spacers, Rob Allison and Jim Hawley . . .
Four of the Rob Allison stories—"Lunar Trap", "The Iron Moon", "Venusway", and "By Jupiter"—were originally published in Boys' Life. "If you can cut in the rocket power before crashing I think we can lift her out of here!" Rob said excitedly. "All traces of an explosive atmosphere are gone from this area, but at my next signal you'll have to cut off again as we rise to the hydrogen layer." "Good boy!" cried Grant, and Rob detected a profound note of relief in his brother's strained voice. Rob was studying the distant shining emerald that was home when Grant's voice again came to him over the speaker. "I guess you deserve a rated spaceman's gold all right, Rob." Rob felt the joy of the moment. "The way you pulled us out of that cyclone, I should say that goes for you too, skipper—I mean, your presidency!" The last story in the book is "Hands Across the Deep"; you can read a condensed version here. was about the first mission to another planet, which was found in orbit around the nearest star, Alpha Centauri. I don't recall if it took them 4 years to get there, or if they'd found some faster-than-light travel. It took only a short time to determine that the small light was indeed a satellite of Proxima. The ship's trajectory was set to intercept the orbit of the planet and the braking jets were cut in. The Andromeda still had millions of miles to go, but every bit of this distance would be needed to bring the enormous velocity of 186,000 miles a second down to a safe landing speed. Atomic power, once thought to be the ultimate answer in space travel, had grudgingly given way to the even greater energies of harnessed cosmic rays. They carried atomic blasters for protection, slogging through bluish mud and a garish mist, not sure where they were headed. The old-fashioned bulky space suit had given way to a transparent plastofabric that fitted almost like a second skin. The lightweight helmet had been perfected so that the wearer could speak and listen as naturally as if he were wearing none. Milo looked at a paper he held. "Here are the main things. The atmosphere is sixty per cent oxygen, with dilution gases forty. It would burn up our lungs, of course. The planet is much smaller than Earth and has a forty-hour day; the year is a hundred and fifty-two days long." meet natives who have telepathy that allows the humans to talk to them. The host motioned for Harl to sit in a rickety chair. Then he made motions for the young commander to start talking. On the spur of the moment, Harl recited the regulations of the Space Command. The man nodded as though this were satisfactory and took up a stance behind Harl's chair. He placed his small, delicate hands on Harl's head and began staring straight ahead of him as though in a trance. When Harl seemed to run down, the man motioned for him to talk on. After nearly a half hour, a halt was called in the demonstration, and, to Harl's astonishment, the man said in perfect English, "Hello." "How is it that—?" Harl asked. "—that I speak your language?" finished the man in a soft tenor voice. "You just taught me. I placed my mind on what you said and the meaning of the words. I do not know all of your speech in such a short time, of course, but I believe we can understand one another." Everything seems fine, but the aliens are afraid of humans' violent background and (with some regret) I think they use their telepathic powers to keep the humans from leaving and reporting back. "It seems that our discussion must end here, for you and your friends are about to die." Harl's dark eyes bored with disbelief into the man opposite. His fingers seized the electron blaster near by. "Will you say that again?" "The Kufaya has said that you must die," the man of Myr Iryra repeated. "I am sorry for you, but that is his decree." Harl's lips curled in bitterness. "You have just finished telling me there is no hatred among your people, yet you are prepared to commit murder without reason!" Jhassa raised a hand to quiet him. "Do not excite yourself. The Kufaya bears you no hatred. It is just that he believes you are a careless, excitable race and may upset the temperament of the people or cause more destruction." "Put down your weapons," Jhassa said quietly to the men. To Harl's amazement, he found himself, with the rest of the men, laying his blaster on the floor in front of Jhassa's feet! "Controlling the wills of others is a new advancement of ours, Spacemaster Gurman," Jhassa said. "Will you give me that packet on your belt? It too may be a weapon." "It's no weapon, it's only a first-aid kit," Harl said. Suddenly he had an idea. "How would you like to see your sister's son well?" he asked. "We never like to see one of our own die, of course," Jhassa replied. "Your nephew's life for our lives, Jhassa," Harl proposed. "You can lose nothing by letting us try." and they're all friends in the end. Jhassa's large meditative eyes glowed with feeling. "We want those supplies and knowledge," he said with great earnestness. The Kufaya said that if you cured the boy he would like you to show us all you can about your science." "I have a proposal to make, Jhassa," Harl said. "Teach us some of your mind magic, let us take pictures and carry on some scientific research on your planet. In exchange, we'll tell you all you want to know about us and our ways." Jhassa offered his thin hand and smiled. "Let us get started, my friend."